Ken Burns’ Thomas Jefferson. Those two names linked by an apostrophe should be ample inducement for Americans to view this two-part documentary. We may not read like we once did, but absorbing history via captivating video works well for the iPad generation. Fortunately, our exceptional American patrimony is tremendously vivid in the hands of Burns and his stellar cast of actors and commentators. Jefferson comes alive here as an American saint. More than that, he appears the quintessential American, which is to say possessed of superlative qualities and dramatic flaws, the latter stemming from power and wealth. He’s the perfect American in being optimistic, enlightened, strong and capable. OK, maybe headstrong and surprising. Those looking for the true spirit of America will find it in Thomas Jefferson. Women will be charmed by Jefferson the poetic lover, steadfast husband and father of daughters. Fans of über-American columnist George Will will be pleased to note that Thomas Jefferson is George Will approved. In fact, it stars George Will, who opines at a key juncture in Part 1 and opens up Part 2. Jefferson is a subject vastly larger than can be covered in a review or even a three hour documentary. Still, here are three thoughts triggered by watching Thomas Jefferson. Jefferson reviled centralized power, but went power-mad as a two term President. It’s that second term that often gets Presidents. Jefferson’s work and life personified American Exceptionalism, eight reasons for which are listed in the Reality commentary below. America turns out some gooooood looking people, Jefferson being Exhibit A. Check out that nickel in your pocket (if you still carry nickels) or his Wikipedia pic, the one by Rembrandt Peale. High forehead and cheekbones, strong jaw, erect bearing: That’s one handsome man. Brad Pitt hopes he’ll look that good in a few years. Sam Waterston does a creditable job voicing Thomas Jefferson. Waterston is ideal playing American characters of great rectitude. Ossie Davis provides primary narration with gravitas and clarity. Plus it must be noted that having an African-American narrate adds a sense of closure to a documentary about a slave-holding apostle of liberty. Several contemporary historians add helpful perspective. George Will provides his uniquely lucid and loving observations about the American Project and Jefferson’s seminal role in it. John Hope Franklin provides an African-American perspective that is harsh but not unreasonable. Andrew Burstein and Clay S. Jenkinson prove most interesting of all the historians, and are fortunately awarded the most screen time. Daniel Boorstin is less impressive than the others, but welcome, given his position as longtime Librarian of Congress. Gore Vidal and Garry Wills are also less impressive than the others, but prove deserving of their big names nonetheless. Beautifully done, albeit a CliffsNotes version of Jefferson’s life. The two 90 minute episodes fly by with five minutes for the building of Monticello, five minutes for his time in Paris, five minutes for the Louisiana Purchase, and so on. The story is impressively balanced, not stinting on his failures as Governor of Virginia and especially as a slave-holder. As to the latter, his rumored relationship with Sally Hemings is presented in non-histrionic fashion, leaving the viewer to assume that it likely never happened. Thanks to PBS for underwriting this documentary and leaving behind a great site to support it and to Netflix for making it instantly available. Elegiac piano often catches the throat. Ken Burns’ signature technique of opening a scene in tight focus on a still image and then pulling out gets fabulously exercised in Episode 1 when he starts tight in on a brick lane full of fancy horses and carriages, only to pull out and reveal the vast gardens of Versailles, all to Sam Waterson as Thomas Jefferson describing his umbrage at Europeans dividing their societies into “wolves and sheep.” Stunning. First people to rule ourselves: In 1776 there were Kings, Emperors, Sultans, a Shogun and a Czarina. People ruling themselves? None, until Jefferson declared the independence of the American people in an unparalleled work of political authorship. Maybe there were other countries where national identity wasn’t a matter of heredity but rather a matter of creed, but who? Believe in Liberty and Justice and you can become an American, albeit not in numbers greater than INS allows. Theoretically. Jefferson wrote that creed, avers George Will in Episode 1. 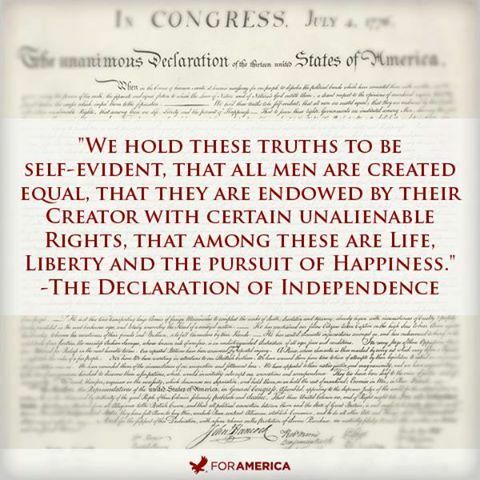 “All men are created equal, endowed by their creator with certain inalienable rights, that among these are life, liberty, and the pursuit of happiness.” Perfection in political thinking laid down in poetic prose. Shakespeare himself never wrote anything greater. Americans – being industrious – value industry. Jefferson advocated personal industry, despised centralized industry. No Government Motors for him. This one isn’t unique to America, though America has always been exceptionally industrious. Jefferson’s Father was a self-made man, wealthy enough to allow young Thomas 15 hours a day of study and violin. Jefferson was stunningly industrious to go along with his Da Vinci-class talent. Did I mention what a handsome man he was? His architecture – Monticello and later UVA – is damn near world historical itself. And that was just a hobby! Given 3 and 4, in America it doesn’t matter who your Father is or was or where you came from. OK, it matters, but in America it can be overcome. Elsewhere it couldn’t. Some places still can’t. Great Americans – and rich Americans – come from all levels of society, all religions and races, a first in the world that remains America’s greatest calling card 237 years later. Class in America is thus more about what you’ve achieved than where you began. Every people hate to be taxed. America fought a revolution over it. Were we the first? Don’t care. Jefferson was joined by a phalanx of political, intellectual, military and financial superstars. The Founders are history’s greatest supergroup. Other countries can boast of great men, even great groups of men, but can they boast of such an all-time great group who were REVOLUTIONARIES? Totally cool. This group pledged “to each other our Lives, our Fortunes and our sacred Honor.” The last of those – Honor – really meant something back then, especially to the Founders, worthies all. Cruel and Unusual Punishment was common before the Declaration of Independence. On orders of the Royal Sovereign, Jefferson was supposed to have his bowels ripped out, then burned in front of his dying eyes, after which he was to be hanged. America became the first country where this was no longer allowed. Truth. Should Jefferson have ended slavery? He couldn’t. Even he wasn’t that exceptional. Should he have freed his own slaves? Yeah, except he was literally carried by slaves from infancy and had expensive tastes coupled with poor business sense, so had little chance of passing that test. He did however inscribe “All Men Are Created Equal” as the American Creed, which led Abraham Lincoln to sacrifice nearly a million Americans as grievous payment for the Emancipation Proclamation & 13th Amendment to the Constitution. Lincoln – we learn in Thomas Jefferson – was the preeminent Jefferson student. Exceptional, even.